1Department of Geology- GATA, Autonomous University of Barcelona, Spain . 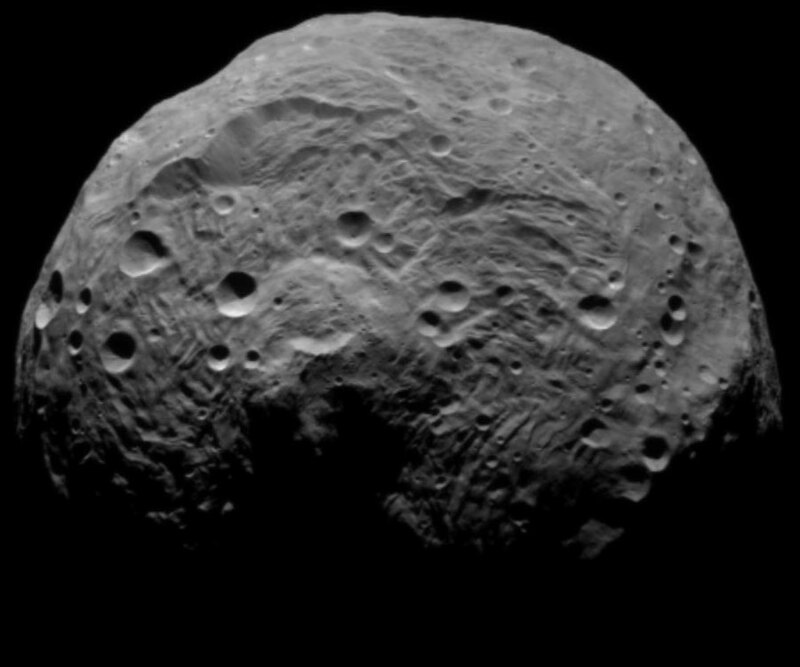 2 Planetary Science Institute, Tucson, AZ 85719, USA. 3State key Laboratory of Information Engineering on Surveying, Mapping and Remote Sensing, Wuhan University, China. Tufa or travertine deposition at spring discharges often produce mounded landforms. 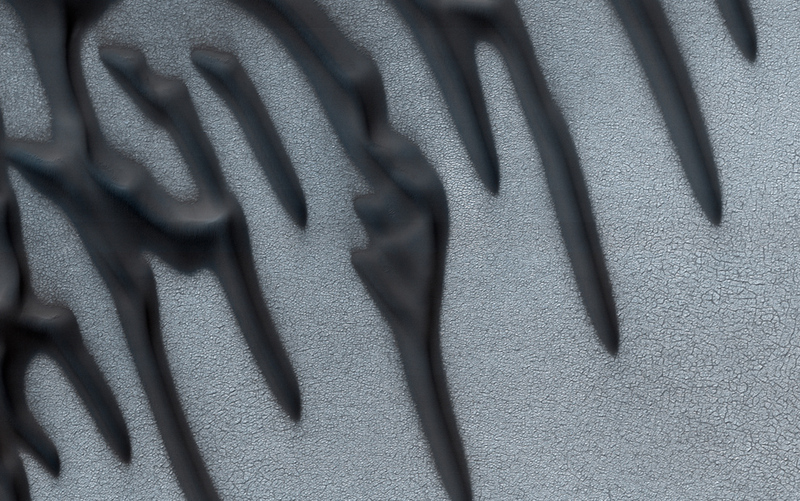 They are one of the least understood calcareous landforms on Earth. Most documented mounds correspond to thermogene travertine. build-up associated with geothermal springs (where the carbon dioxide comes from thermally generated sources). See May 2009 image of the month. In contrast, work on meteogene mounds (where the carrier carbon dioxide originates in the soil and epigean atmosphere) are quite scarce (Linares et al, 2010). Image 1 (A) Shaded relief view of the Tremp Basin. (B) Geologic map of the study region in Isona area. (C) Electrical resistivity cross-sectional view of the central part of a tufa mound (inset in panel B). Note the cistern-like geometry of the pool facies and the overhanging upflow side of the rimstone. Number 1-2 respectively correspond to Rimstone and Rimstone with crescentic geometry. 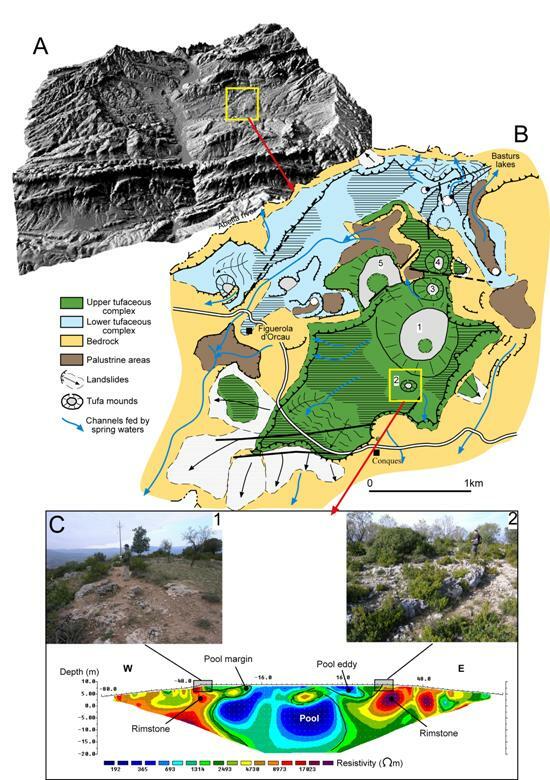 A geologic investigation of the Tremp-Isona sedimentary basin in the Spanish Pyrenees reveals a field of tufa mounds (Image 1). These tufa mounds highly resemble landforms found in Martian boundary plains in the region of southern circum-Chryse (Image 2). In both regions tectonic structures produced during contractional deformation appear to have significantly influenced the formation and perching of regional aquifers (Images 3 and 4). Image 2. Region of southern circum-Chryse showing setting of hypothesized tufa mound. Part of MOC R0903319. An analogous mode of formation for the Martian features would suggest that during the Late Hesperian spring discharges may have led to the formation of small lakes at the surface, which would be consistent with the existence of aquifers at shallow depths within the Martian cryosphere. Image 3. Sketches showing the regional hydrogeologic setting: (A) Discharge from a karstic aquifer along a thrust fault ; flat topography and high hydraulic head. (B) Hypothetical evolution of the system controlled by the entrenchment of the drainage network. (C) Part of MOC R0903319 show Martian feature that has a similar morphology to the investigated tufa mounds. Image 4. 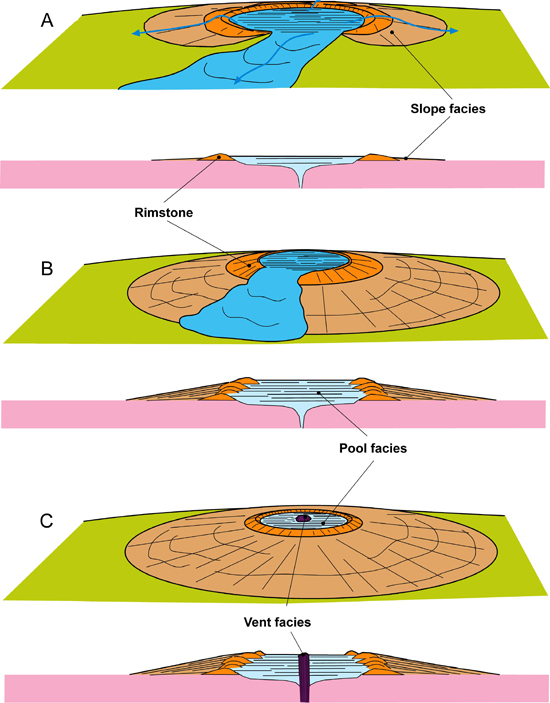 Sketches of tufa mounds of Isona shown in 3-D and cross-section. (A) Annular tufa barrier development along zones of peripheral overflow. (B) Repeated overflow results in vertical aggradations and downslope progradation of mound. (C) Hydrologic activity ceases. Allen, C.C. and D.Z. 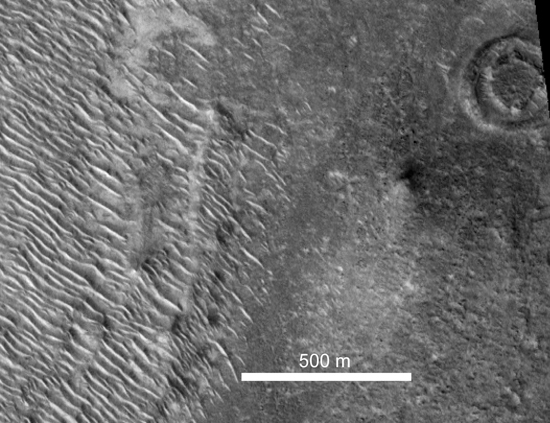 Oehler, A Case for Ancient Springs in Arabia Terra, Mars. Astrobiology, 2008. 8(6): p. 1093-1112. Baioni, D. and F.C. 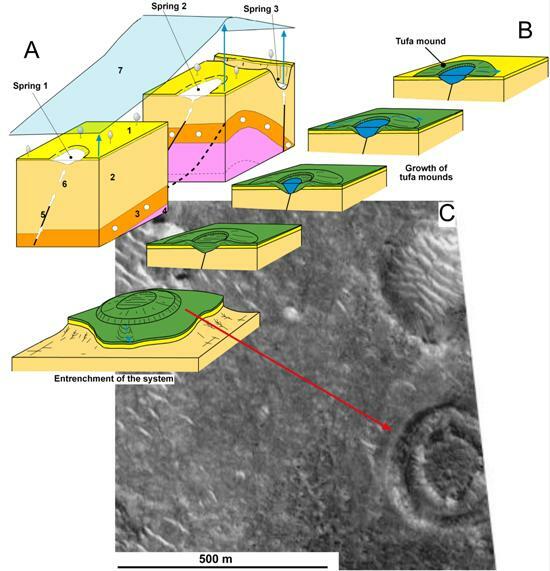 Wezel,Morphology and origin of an evaporitic dome in the eastern Tithonium Chasma, Mars. Planetary and Space Science, 2010. 58(5): p. 847-857. Brakenridge, G.R., H.E. Newsom, and V.R. Baker,Ancient hot springs on Mars:Origins and paleoenvironmental significance. Geology, 1985. 13: p. 859-862. Farrand, W.H., L.R. 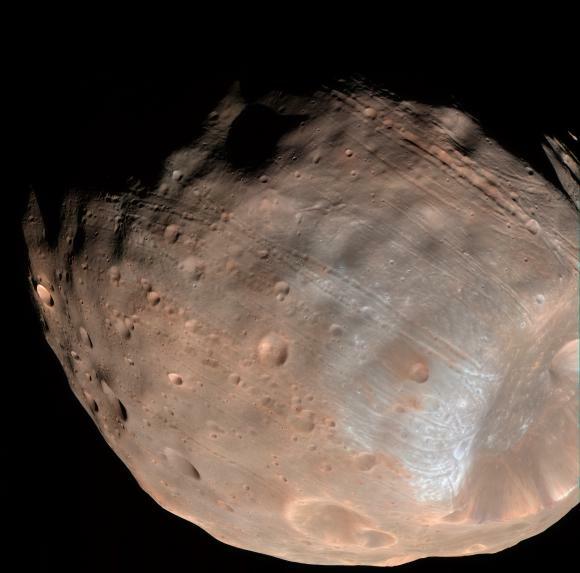 Gaddis, and L. Keszthelyi, Pitted cones and domes on Mars: Observations in Acidalia Planitia and Cydonia Mensae using MOC, THEMIS, and TES data. Journal of Geophysical Research (Planets), 2005. 110(E05005). Rossi, A.P., et al., Large-scale spring deposits on Mars? Journal of Geophysical Research (Planets), 2008. 113(E08016): p. doi:10.1029/2007JE003062. West, M.D., et al., The geology of Australian Mars analogue sites. Planetary and Space Science, 2010. 58: p. 447-458.